The Beatles 50 Years Ago Today: April 29, 1967. Beatles Radio: The Beatles, Solos, Covers, Birthdays, News The Fab 4 and More! On this day, and into the night, a benefit party for the underground newspaper International Times was held at London's Alexandra Palace. 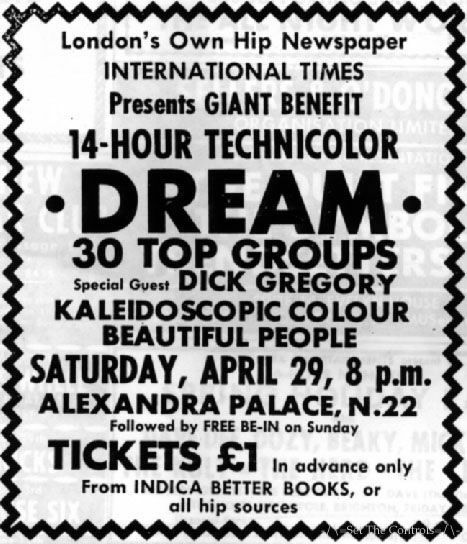 The 14 Hour Technicolour dream was a multi-artist happening featuring poets, artists and musicians. The headline act was Pink Floyd, and the other performers included Arthur Brown, Soft Machine, Tomorrow, The Pretty Things and Yoko Ono. John Lennon and John Dunbar saw a news item about the event on the television at Lennon's home in Weybridge while tripping on LSD, and decided to attend. Lennon called his driver who took them to the venue. Film footage from the event shows Lennon.